Australian author Debbie Malone is a psychic, clairvoyant and medium and was the 2013 Australian Psychic of the Year. She can receive visions from the living and the dead, the past, present and future, and convey messages to loved ones. As if this isn't enough, Debbie has also assisted Australian Police with missing persons cases and murder investigations for more than twenty years. Despite having been on several TV shows, I first saw Debbie when she worked on the TV show Sensing Murder so I was understandably keen to read her book. (Love that show*). 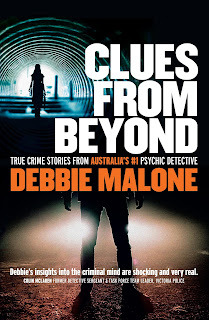 In Clues From Beyond - True Crime Stories from Australia's #1 Psychic Detective, Debbie shares her insights on several well-known cases in Australia and it makes for gripping reading. If you're going to read Clues From Beyond, (or books like it), it's important to know that psychics often aren't able to solve a case on their own. Just as a case isn't solved with DNA alone, or police surveillance alone, a psychic detective is just one of many resources involved in solving a case. On page 8, Debbie herself says: "I am an investigative resource who can be utilised by police to pick up information that may provide new lines of inquiry in an unsolved crime." I think readers need to keep that in mind when reading books like these. Debbie's insights are remarkable and I enjoyed the format chosen for the book and the cases she writes about. When reading about the case of Kerry Whelan, I was incredibly frustrated, (as I'm sure Debbie is too) that Detectives won't/haven't searched underneath Bruce Burrell's shearing shed for the remains of Dorothy Davis because it was outside the scope of the case she was on. They were looking for the remains of Kerry Whelan during which time Debbie received this information and it wasn't acted upon. Argh! I just want someone to dig up that shearing shed damn it! After reading Clues From Beyond I definitely wanted to know more about Debbie and her gift as a spirit medium, so I'll be reading her memoir Never Alone: A Medium’s Journey soon. I'm also looking forward to an interview that could be on the cards, so fingers crossed for that one. Clues From Beyond is recommended for readers of the true crime genre and those with an interest in psychic detectives and the work they do. P.S. * You can read my review of Sensing Murder by Nicola McLoy here. Thanks for your kind words Mark.